I recently came across a new book that I just had to share! Do you long to stay home with your kids and work from home? Or…are you a stay at home mom already, but want start a business working from home to fulfill your dreams and aspirations? I have been a stay at home mom for a few years now. I have a 7 year old son and a 5 month old daughter. Being a stay at home mom can be tough, but I love it. Blogging is one of the things I do often and I hope to eventually monetize it so that I can continue to stay at home with my kids. Author, Holly Hurd from VentureMom.com , has written a guest article sharing some unique tips on how to decide what business to start; tips which can be found in her new book! For many people, the decision to start their own business comes easy. They know they want to be their own boss. They know they want the freedom of working for themselves. They know they want to build something that lasts for their families. But the next question is a lot harder. The best businesses are always the ones the owners are passionate about. You may fall into a great opportunity to own, say, a bakery. It may make a lot of money. But if you aren’t interested in baked goods and baking, you won’t give it your all. Your motivation will wane and eventually it will just feel like a job. I meet a lot of women (and men) who have a fire inside them to start a business, but they can’t get past that question of what to do. They spin their wheels, bouncing from one idea to the next, never really deciding on anything, until they eventually give up. In my book, Venture Mom: From Idea to Income in Just 12 Weeks, I go into detail about picking your business, but here are three basic tips to get you started. You can learn more on this subject and how to turn your idea into a profitable venture in my book. Often our entrepreneurial passions come from our past. Maybe you loved putting together photo books for family and friends, but motherhood got in the way and your hobby was the first to go. Perhaps you led a fitness group with your friends years ago or took people on guided tours of your city. Maybe you knitted baby booties for each of your children or helped your friend redesign her retail store for better sales. Just because something used to be part of your life doesn’t mean it can’t be again. Turn those old hobbies into profit today. When people throw you a compliment, it’s because you’re so good at something, it’s worth mentioning. If you hear, “I love your garden,” take note. You may think everyone can plant a beautiful garden, but that's usually not the case. Your talent is someone else's pain. If someone says, “You make the most amazing homemade ice cream cakes,” maybe you have a baking skill that people will pay for. Take notice when someone compliments something you have made or something you do. For example, let's say you craft your own belt buckles and you hear, “I love that belt buckle, where can I get one like it?," that could be a clue to a venture. Or they might say something like, “Your garage is so neat and organized. I wish someone would help me get my garage cleaned out," or "I love how you style your bookcases, would you ever do that for me?" or "You're so good at putting together outfits. Will you come help me clean out my closet and put together my wardrobe?" These are clues that you have a talent that others could use. This is the simplest way to pick a business idea. Obviously the best thing to sell (product or service) is something you’re good at. People get caught up on this one because they don’t feel their talents are marketable, but that’s rarely true. Some ideas may take more time or more work than others (and may involve a lot of learning), but there’s a market out there to sell pretty much anything. Let’s say you just love bird watching. “You can’t make money bird watching,” you think. Wrong. With the Internet, you can turn anything into a venture. You could find people online and take them on bird tours of an exotic area. You could catalog your finds in an eBook and sell it on Amazon. You could build a website and blog around bird watching and create content that attracts users (and eventually advertisers). Just about anything that you have an intense interest in, can be made profitable. At the end of the day, you have to be the one to make the decision. Any venture you start will have ups and downs but if you are doing something you are passionate about, it won't feel like work at all. There will be days when you doubt your idea but soldier on and it will be worth the pursuit. Half the fun is the path. Learning to trade commodities and futures from her father in her teens, Holly was destined to be an entrepreneur. Right out of college, she began several small companies. While still in her 20s, Holly was featured in Fortune Magazine, USA Today, Working Women’s Magazine and more. 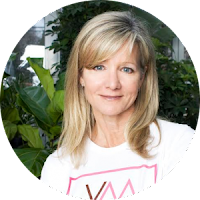 Holly also became a public speaker, sold and remodeled real estate, created a line of glass coffee tables, managed hedge funds, and then found her passion of sharing stories of moms who started businesses – just like she had done all her life: VentureMom.com.